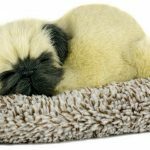 Cuddle alongside these adorable Pug Perfect Petzzz Minis while they sleep peacefully on their plush berber bed. 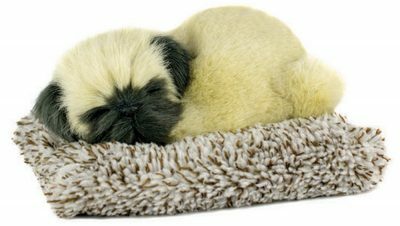 These petzzz are made of a plush synthetic fur that is soft to the touch and hypoallergenic. They are soothing to pet and fun to play with! The original Perfect Petzzz have a belly that moves up and down while the dog sleeps. These Perfect Petzzz Minis make an adorable snoring sound while they sleep. Push the hidden button on their back to hear them snore. Their belly does not move up and down like their larger family members. Buy an original Perfect Petzzz and a Perfect Petzzz Mini to make your own little puppy family!